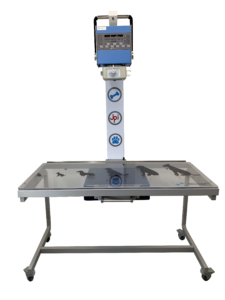 The new JPI DirectVet 110-volt Veterinary Digital X-ray combines our robust ExamVue Software, easy-to-install Vet-view Veterinary Table and high quality, cost-effective digital detector for a complete system that can be set up in one hour. The DirectVet system gives you quality digital x-rays, allowing your practice to hit the ground running at an attractive cost without special preparations, power supply, or construction. High-precision, low-error diagnosis. The IONA detector with DQE over 40%, and 16 bits dynamics range generates outstanding quality images that help users to reveal the slightest details for a subject. The detector is read to shoot within 5 seconds of setup. Consecutive images are available in less than 4 seconds, allowing practitioners to increase productivity while also boosting client satisfaction.